My friend, Sharon, got into the habit of drinking kombucha every day a few years ago. Once, about three years ago, when she and I were in Whole Foods, she explained what it was to me. Frankly, I was a tad grossed out. (More in a moment about those details) But, I put my game face on and tried it. It was DELICIOUS! Then I did some research (like I always do...lol) and found out about all the health benefits of this drink. I'll write another article on that soon, but suffice to say, I was very impressed---especially by all the probiotics contained in it. I have to admit, though, that the one deterrent for me purchasing commercial kombucha was the cost. At upwards of $3.00 for a small 16 ounce bottle, it just seemed a bit outrageous. So, I did not get into the habit at that time. For a once in awhile splurge, that was fine. But not every day, or even a few times a week. My kombucha use was very limited back then. Fortunately, after nearly another year went by, another great friend, Juliana, had started making her own kombucha in her kitchen. Wow! I was impressed! Making fermented tea in your own kitchen? Who knew? (Obviously, this was WAY before I got into the traditional foods kick I'm in now.) And isn't that just so cool about life? You just keep learning!!! I love it!!! So Juliana gifted me with one of her extra SCOBYs, gave me some quick and easy instructions, and I was OFF like a madwoman to make my own. Making herbal kombucha is a delicious creative art---as well as a science! Find out how to use the fermented teas typical of kombucha along with herbal loose leaf teas for health and taste to your first batch kombucha! YUM! What on Earth is Kombucha??? Before I go into my adventures with the making of kombucha, let me explain a bit about what it is. Making kombucha was my gate way to learning to ferment, and beginning to ferment ALL kinds of foods. But I started with kombucha...easy, peasy. Kombucha is essentially a fermented sweet tea. And fermentation is essentially a way of using bacteria and yeast to help preserve foods and drinks. Fermentation has been around for centuries, and so has kombucha. That's what I said!!! Yep! I did. And I still have friends and family members, all these years later, who can hardly bear to look at the fermentations going on on my kitchen counter. It's kind of funny. A well developed SCOBY floating around in a jar of darkish liquid on your counter looks kind of....well, gross. But bacteria is good. And yeast is good. Good bacteria and good yeast go together to cause good things to happen in your body. I could spend a LOT of time going into the science of all of this, but I think you get the picture. Bacteria and yeast take many forms, depending on the vast variety of different strains of each. A kombucha SCOBY (Symbiotic Culture of Bacteria and Yeast) is a colony of millions, probably billions or trillions, of bacteria and yeast growing and living together in synchrony. If the balance is upset, then bad things will happen to the SCOBY, but generally it takes quite a bit for that to happen. A SCOBY may also be called "the Mother" because baby SCOBYs tend to grow from them, or a "mushroom" because of how it looks. See my article on "What is in Your Kombucha"
Here is a picture of a bunch of healthy SCOBYs hanging out together in their "hotel." Here are several healthy SCOBYs being saved in a SCOBY "Hotel." This is a place where they can be kept when they are not actively fermenting a new kombucha batch. What Do I Need to Make a Batch of Kombucha...Besides a SCOBY? You can get one of these from a friend (like I did), you can find them on etsy from fermentation fans, or you can even purchase them in dehydrated form. The advantage of getting one from a friend is that you are helping her out by taking one of the multitude of "babies" off her hands, AND it's free!!! Finally, the advantage of purchasing a SCOBY from a larger online business that specializes in fermentation is that it will have been tested for potential pathogens and therefore be very safe. It will also most likely come in a dehydrated form with directions for rehydration, where in the choices above, you will start with a (hopefully) plump and healthy SCOBY. 2. A half-gallon or gallon size wide-mouthed jar. I definitely recommend you using a wide-mouth jar for making or storing kombucha. At. All. Times. A jar with a mouth the size of a wide-mouthed Mason jar is fine. I like the half-gallon or gallon jars from Specialty Bottle company. They are inexpensive, and are perfect for kombucha. I had a small problem one time. I put my beautiful kombucha brews into very nice swing-top Grolsch bottles (see above picture) to store. Well, more baby SCOBYs began to form, and before I realized, I couldn't get them out of the narrow necked bottles. DARN!! I had to lose the SCOBYs as well as the bottles. You have to use "real" tea, which is from the Camellia sinensis plant. Essentially, these teas consist of white tea (the least processed), green tea, oolong tea, or black tea (the most processed). These are fermented, and are the teas used as the foundation of kombucha. I'll usually add medicinal herbs to the brew for taste or health reasons too. Herbs like hibiscus, mint, cinnamon or nettle, dandelion, burdock can provide a vast variety of tastes and benefits. But you must start with the Camellia sinensis (regular old tea). I buy my loose leaf herbal teas Here. You can use plain tea bags from the store (green tea, black tea, etc.) HOWEVER, in my opinion, these are not optimal. Tea purchased in boxes in commercial tea bags are generally very oxidized, not nearly as fresh, and therefore, not as strong. The quality of commercial bags is undeniable poor, especially when compared with loose leaf bulk herbs. My opinion comes from many years of experience working with herbs. I recommend you buy high quality loose leaf herbs and tea from a reputable company. Starwest Botanicals is a great choice, and it's where I buy about 98% of my herbs (the ones I don't grow or forage myself, that is). Your starter culture is basically a bit of room temperature kombucha from a previous batch. If you don't have any, then you can use plain, unflavored kombucha from the store. You'll need about a cup or so for a gallon of booth! If you get your SCOBY from a friend or from etsy, this starter (usually about 1/2 to 1 cup full) will generally come along with it. Otherwise, you may need to purchase a good bottle of kombucha: raw, unfiltered and unsweetened with any type of fruit or other flavoring, from the store to use. The best sugar to use is plain white cane sugar, as it doesn't affect the SCOBY negatively, and your results are pretty consistent. Honey is the next best option. If you are just beginning your kombucha brewing journey, I recommend starting with organic cane sugar, and after a few brews, branch out into other sweeteners from there! Always make sure you have some extra SCOBYs on hand, before beginning any type of experimentation, just in case you kill one off accidentally. And that's it! A SCOBY, a good wide jar, tea, the starter, and sugar. Brewed black tea in the background, a SCOBY and starter in the cheesecloth-covered jar, half cup of sugar (for one-half gallon of kombucha), and the wide-mouth jar I plan to use. FTC Disclosure: Affiliate links are included in this article. This simply means that if you click through on any of the them and make a purchase, I may earn a very small commission at no extra cost to you. Interested in learning to blend your own herbal teas? This eBook gives you clear instructions along with some great recipes to start you off right! Strain out the loose leaf tea from your brewed tea. IT MUST BE ROOM TEMPERATURE--ABOUT YOUR BODY TEMPERATURE AT THE MOST BEFORE YOU ADD YOUR SCOBY. Or, you will kill your SCOBY. DANGER!!!! Note: The tea in these photos is VERY dark. That's because I chose to use good loose leaf Black Tea. Always be sure your tea is unflavored and has no other additives. I usually use White Tea or Green Tea. It's a lighter color. Straining out the Black Tea leaves, so I just have brewed black tea in the half-gallon jar. Pour in your sugar. The ratio is 1 cup to 1 gallon of brew. So, since I am using a half-gallon jar for this particular brew, I am using 1/2 cup of sugar. 1/2 cup sugar to 1/2 gallon jar. OR 1 cup sugar to 1 gallon jar. Simple!!! Stir the sugar and tea until the sugar is dissolved. Now, again, BE SURE THE TEMPERATURE OF THE LIQUID IS ROOM TEMPERATURE OR SO. 70 degrees approximately is perfect, but if it's a little higher, that's fine. It should definitely be no warmer than about 90 degrees at the most. Add in your SCOBY and the starter culture! Here is my SCOBY floating at the top of the brew. It's fine if it floats, or it may sink to the bottom. It's all good. As long as you see bubbles in a few days, you're fine! Over the next few days, you will notice your SCOBY floating to the top! That's a great sign! Cover the jar with a fine cloth or cover. You don't want large holes. Fruit flies LOVE this stuff, let me tell you! Several layers of cheesecloth, a coffee filter, or even a piece of old clean cotton sheet works just fine. Hold in place with a rubber band or tie it up with string. Wait patiently! After a few days, you should see bubbles starting to form at the top. This is good! It means the brew is fermenting just fine! The fermentation process takes anywhere from about a week to several weeks. You'll have to do some taste tests. The best way to do this is get a clean straw, cover one end with your finger, insert the straw into the top of the bottle and down the side so you don't disturb the SCOBY on top (if it's there). Then remove your finger from the top and allow the straw to fill as much as you desire, cover the top again, and remove. You can now taste the kombucha in the straw! If it is too sweet, it needs to ferment longer. If it is beginning to taste like vinegar, you may have waited too long (although some people like it more tart). I like it on the tart side myself. If it is too sweet, that means there is still a little too much sugar in the brew. The sugar, by the way, is the food for the SCOBY. As it consumes the sugar, it will grow and produce a "baby." That's why you don't really need to worry much about a good brew of kombucha containing too many calories. The sugar is generally about gone if it's a good brew. P.S. If you haven't already, I hope you'll sign up for our newsletter! You'll never miss a thing, PLUS you'll get access to my FREE Resource Library, which contains my eBook: "How to Relax with Herbs." Check out my eBook, and learn to create your own tasty and health herbal tea blends! If you would like a kit to get you started, you can take a loot at this one! 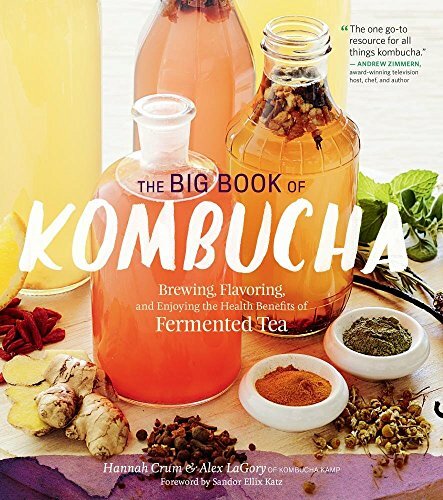 Here is a book that is EXCELLENT for learning everything you ever wanted to know about kombucha, in addition to tons of recipes for turning your brew into an herbal or fruit delight!!! My mom bought this for me when she went to the Mother Earth News Fair, and I have enjoyed it immensely. Actually, this is the book that taught me how to do a 2nd ferment!! These are affiliate links, so if you choose to buy it by clicking on the image below, it will not cost you anything, but it will help me make a very small commission. I am hoping these will add up someday and help support my blogging! Disclaimer: I am not a medical doctor, and any statements made in this article are for informational purposes only and not meant to treat, diagnose, prevent, or cure any health issue. Please see a medical professional for health concerns.